Therapy with immune checkpoint inhibitors (ICIs) heralds a new era in the management of many cancers. In particular, immunotherapy directed toward cytotoxic T-lymphocyte–associated antigen 4 and the programmed-cell death-1 (PD-1) receptor and its ligand, PD-L1, has demonstrated remarkable and durable responses in several types of cancer, including melanoma, non–small-cell lung cancer (NSCLC), renal-cell carcinoma (RCC), urothelial carcinoma (UC), and head and neck squamous-cell carcinoma (HNSCC). However, to optimize treatment with ICIs, there is a need to discover validated biomarkers that can guide treatment decisions and help identify patients who are more likely to respond to ICIs and less likely to experience immune-related adverse events (irAEs) or develop resistance to these agents. PD-L1 expression is a rational biomarker to predict response to PD-1/PD-L1 ICI therapy, and has been studied extensively in clinical trials. A recurring theme emerging from available clinical data is that high levels of tumor cell membrane PD-L1 expression correlate with better outcomes with PD-1/PD-L1 blockade. However, it is also becoming apparent that patients with low or undetectable tumor PD-L1 expression may still gain benefit from checkpoint inhibition. This review summarizes the clinical evidence and relevance of PD-L1 tumor expression as a predictive biomarker for PD-L1–directed therapies across tumors, as well as the PD-L1 testing landscape, including the comparability of available PD-L1 immunohistochemistry (IHC) assays. Here, we present relevant data on the predictive role of PD-L1 expression for the approved anti–PD-1/PD-L1 agents in various types of cancer, with differential effects observed across tumor types and with different PD-1/PD-L1 ICIs. At the 2018 American Society of Clinical Oncology annual meeting, investigators presented results from the phase 3 open-label KEYNOTE-042 study that compared pembrolizumab with chemotherapy (carboplatin plus paclitaxel or carboplatin plus pemetrexed) in 1274 patients with locally advanced or metastatic NSCLC and much lower PD-L1 expression (tumor proportion score [TPS] ≥1%).14 In the highest TPS group, the response rate with pembrolizumab was 39.5% versus 32.0% with chemotherapy. In the TPS ≥20% group, the response rates were 33.4% and 28.9%, respectively, and in the TPS ≥1% group, they were 27.3% and 26.5%, respectively. The duration of response was longer with pembrolizumab; in the full TPS ≥1% cohort, the median duration of response was 20.2 months compared with 8.3 months with chemotherapy. Pembrolizumab is now an option for patients who have advanced NSCLC and no EGFR mutations or ALK translocations, and who express PD-L1 at least at the 1% level. However, the results from KEYNOTE-042 demonstrated a greater OS benefit from pembrolizumab monotherapy compared with platinum-based chemotherapy in patients with PD-L1 expression ≥50% versus those with PD-L1 expression 1% to 49%.14 The median OS in patients treated with pembrolizumab monotherapy versus chemotherapy was 20.0 months and 12.2 months, respectively, in those with PD-L1 ≥50% (P = .0003); 17.7 months versus 13.0 months, respectively, in those with PD-L1 ≥20% (P = .0020); and 16.7 months versus 12.1 months, respectively, in those with PD-L1 ≥1% (P = .0018).14 These results provide further evidence for the utility of higher levels of PD-L1 in selecting patients with NSCLC for ICI monotherapy. In the phase 2 CheckMate 063 trial of patients with advanced refractory squamous NSCLC, nivolumab therapy also benefited both the PD-L1–positive and PD-L1–negative groups, although a greater percentage of objective responses was observed in patients with PD-L1–positive tumors (<5% vs ≥5%: 38% vs 52%, respectively).16 The 2 parallel phase 3 CheckMate 017 and CheckMate 057 studies comparing nivolumab with docetaxel in patients with previously treated squamous and nonsquamous NSCLC, respectively, indicated that overall response was similar in PD-L1–positive (≥1%) and PD-L1–negative (<1%) tumors in patients with squamous NSCLC who were treated with nivolumab (17% vs 17%), but a strong predictive association was evident in nonsquamous NSCLC across the tumor PD-L1 expression levels assessed (1%, 5%, 10%), suggesting a dependence on tumor histology.17,18 In CheckMate 057, ORR related to PD-L1 expression was 31% in the PD-L1 level ≥1% cohort versus 9% in the PD-L1 level <1% cohort; 36% in the PD-L1 level ≥5% cohort versus 10% in the PD-L1 level <5% cohort; and 37% in the PD-L1 level ≥10% cohort versus 11% in the PD-L1 level <10% cohort.17 These results indicate that both patients with squamous NSCLC and patients with nonsquamous NSCLC may derive survival benefit with second-line nivolumab therapy independent of PD-L1 expression level, and that PD-L1 testing results do not inform treatment decisions in these settings. The FDA does not mandate PD-L1 testing for the use of nivolumab in patients with NSCLC. In terms of the role of PD-L1 expression in predicting benefit from therapy with atezolizumab, increased clinical benefit was seen with increasing PD-L1 expression on tumor cells and tumor-infiltrating immune cells in the POPLAR and OAK trials.21,22 In both trials, patients were stratified on the basis of PD-L1 expression on their tumor cells and tumor-infiltrating immune cells. Tumor cell (TC)3 represented patients with a percentage of PD-L1–expressing tumor cells ≥50%, TC2 represented patients with PD-L1–expressing tumor cells ≥5% and <50%, TC1 included PD-L1–expressing tumor cells ≥1% and <5%, and TC0 included PD-L1–expressing tumor cells <1%. Tumor-infiltrating immune cell (IC)3 had PD-L1 expression ≥10%, IC2 had ≥5% and <10%, IC1 had ≥1% and <5%, and IC0 had <1%. The randomized, open-label, phase 3 OAK trial demonstrated clinically relevant improvement in OS with atezoliz­umab versus docetaxel in previously treated NSCLC regardless of PD-L1 expression, but with increasing magnitude of responses with increasing PD-L1 expression.22 ORR was 30.6% in the TC3 or IC3 population, 22.5% in the TC2/3 or IC2/3 population, 17.8% in the TC1/2/3 or IC1/2/3 population, and 7.8% in the TC0 or IC0 population. In the ongoing randomized, double-blind, phase 3 KEYNOTE-407 trial, researchers are evaluating pembrolizu­mab plus carboplatin-paclitaxel and nab-paclitaxel chemotherapy or chemotherapy alone as first-line therapy in patients with metastatic squamous NSCLC (NCT02775435).26 The first interim results of this trial showed that in the initial 204 patients (median follow-up of 7 months) the combination of pembrolizumab plus chemotherapy significantly improved OS and PFS compared with chemotherapy alone, reducing the risk for death by 36% (HR, 0.64; 95% confidence interval [CI], 0.49-0.85; P = .0008) and disease progression by 44% (HR, 0.56; 95% CI, 0.45-0.70; P <.0001). Prespecified exploratory analyses based on PD-L1 expression demonstrated an OS and PFS benefit with pembrolizumab combination therapy regardless of PD-L1 expression. In the pembrolizumab combination group, patients whose tumors did not express PD-L1 showed a 39% reduced risk for death (HR, 0.61; 95% CI, 0.38-0.98), those with TPS of 1% to 49% showed a 43% reduced risk for death (HR, 0.57; 95% CI, 0.36-0.90), and those with TPS ≥50% (HR, 0.64; 95% CI, 0.37-1.10) showed a 36% reduced risk for death; reductions in risk for progression were 32% (HR, 0.68; 95% CI, 0.47-0.98), 44% (HR, 0.56; 95% CI, 0.39-0.80), and 63% (HR, 0.37; 95% CI, 0.24-0.58), respectively. Current evidence indicates an imperfect correlation of PD-L1 expression and ICI efficacy in melanoma, with considerable responses achieved by patients with tumors expressing low or undetectable levels of PD-L1. For example, in the randomized phase 3 CheckMate 067 trial, nivolumab combined with ipilimumab resulted in a higher ORR than the nivolumab monotherapy group at each PD-L1 expression level tested.31 However, in the combination arm, an ORR of 85% was achieved in the population demonstrating ≥10% PD-L1 expression versus 55% in those demonstrating <10% expression, whereas in the monotherapy arm, ORRs were 58% and 44%, respectively. Of note, patients determined to be PD-L1–negative (tumor PD-L1 expression <1%) also achieved objective responses in both nivolumab arms, with an ORR of 54% in the combination arm and an ORR of 35% in the monotherapy arm. Moreover, in time-dependent receiver operating characteristic curves generated for OS at 3 years that were used as a measure of discriminatory ability of tumor PD-L1 expression, area under the curve (AUC) values were more aligned with the line of no discrimination (AUC, 0.50) for both the combination group (AUC, 0.56; P = .09) and the nivolumab monotherapy group (AUC, 0.57; P = .04), indicating that the level of tumor PD-L1 expression alone is a poor predictive biomarker of OS in melanoma treated with nivolumab.31 Similar findings were documented in the CheckMate 066 trial, where 33.1% of the patient population responded to nivolumab therapy despite having negative or indeterminate tumor PD-L1 expression levels; ORR was 52.7% in the PD-L1–positive subgroup.32 Thus, the predictive value of PD-L1 is imperfect in this patient population, since overexpression of PD-L1 can be predictive of a response to nivolumab, although patients with no expression of PD-L1 still respond to this agent. Cohort 1 of the IMvigor 210 trial and KEYNOTE-052 explored the predictive value of PD-L1 expression in platinum-ineligible patients with mUC.41,42 In the IMvigor 210 trial, atezolizumab administered as first-line treatment in cisplatin-ineligible patients with locally advanced and metastatic UC provided clinical benefit regardless of PD-L1 expression; ORR was 26% in the cohort with <1% PD-L1 expression and 31% in the ≥5% PD-L1 subgroup.41 In the single-arm phase 2 KEYNOTE-052 trial of first-line treatment with pembrolizumab, the highest ORR was achieved in the PD-L1 cohort with a CPS ≥10% (39%). However, responses were also evident in the other 2 cohorts: the PD-L1 cohort with a CPS of ≥1% to <10% had an ORR of 20% and the PD-L1 cohort with a CPS <1% had an ORR of 11%.42 Based on these findings, it may be premature to assign platinum-ineligible patients with mUC to therapy with atezolizumab or pembroliz­umab solely on the basis of PD-L1 expression. In the expansion cohort of the open-label, single-arm phase 1b KEYNOTE-012 trial, HNSCC patients with tumor PD-L1 expression ≥1% achieved an ORR of 19%, while those with <1% PD-L1 expression achieved an ORR of 16% (P = .348); however, when measuring PD-L1 expression from both tumor cells and immune cells, there was a statistically significant increase in the probability of response among patients with PD-L1–positive tumors compared with patients with PD-L1–negative tumors (22% vs 4%; P = .021).44 Although the small number of events observed in this study preclude broad interpretation of these findings, the preliminary data suggest that PD-L1 expression on tumor-infiltrating immune cells may also be an important determinant of clinical outcome in HNSCC. As part of the clinical development of approved ICIs, tissue-based diagnostic PD-L1 assays were developed in parallel with the therapeutic agents as potential companion biomarkers. This has led to considerable variability in PD-L1 testing, with unique PD-L1 diagnostic systems developed for each anti–PD-1/PD-L1 agent, including a primary antibody clone, detection reagents, a staining platform, quantitative staining cutoffs for positivity, and a software protocol agent. This poses a challenge to clinicians in everyday practice with respect to clinical application and treatment decision-making due to limited availability of tissue samples, the number of tissue-based diagnostic tests required in the management of a patient, and the complexity of testing and interpretation of results. For NSCLC, 4 PD-L1 assay systems are currently FDA approved as companion or complementary diagnostics to anti–PD-1/PD-L1 agents (Table 2).4-7,45 It must be noted that a companion diagnostic test is required for the approved use of the drug and is specified in the FDA prescribing information for the drug. In contrast, results of complementary diagnostic tests are considered predictive, but are not required for prescribing the drug. Based on this evidence, it would be prudent to avoid substitution of diagnostic PD-L1 assays for the approved anti–PD-1/PD-L1 agents. However, given the concordance between 3 of the PD-L1 antibody clones, there is promise in the future for interchangeability following more rigorous studies with larger data sets and real-world samples. As the field of immunotherapy continues to evolve, selection of patients who will respond best to immunotherapy directed toward the PD-1/PD-L1 axis remains a challenge, underscoring the need for identification of predictive biomarkers. Clinical research efforts have focused on evaluating the role of PD-L1 expression status on tumor cells and tumor-infiltrating immune cells to predict clinical benefit from anti–PD-1/PD-L1 antibodies in many cancers. As outlined in this review, there are limitations to the capability of PD-L1 expression in predicting response to ICIs. PD-L1 expression is variable and appears to depend on multiple factors, including tumor histology, the assay antibody used to measure expression, the cell component assessed (tumor cells and/or tumor-infiltrating immune cells), and the staining cutoff applied (eg, 1%, 5%, 10%, 50%). Based on the available evidence, although higher levels of PD-L1 expression may indicate a greater likelihood of response to anti–PD-1/PD-L1 ICIs, it is an imperfect biomarker of response and may not be suitable as a definitive biomarker to select patients for PD-1/PD-L1 blockade across tumor types and in response to different ICIs. This conclusion is primarily based on evidence suggesting that patients with tumors expressing low or undetectable levels of PD-L1 may also derive benefit from anti–PD-1/PD-L1 therapy, which is in direct variance with the ideal characteristics of a clinically useful predictive biomarker.17,24,31,32,38,43 As an ideal biomarker, PD-L1 expression on both the tumor and tumor-infiltrating immune cells would be expected to identify potential responders or nonresponders based on a positive or negative PD-L1 test result, facilitating the selection of patients who are likely to respond to anti–PD-1/PD-L1 antibody therapy, while sparing nonresponders from unnecessary treatment and potentially harmful irAEs.34 Currently, we are not at that juncture with PD-1/PD-L1 as a predictive biomarker for ICI therapy. Given the dynamic nature of PD-L1 expression, use of archival tissue may not be optimal for PD-L1 testing because it may not reflect the true PD-L1 status, which may be affected by variations in tissue fixation, storage, and antigen retrieval, all of which can impact the PD-L1 expression readout.34,45 Moreover, standardization of the staining and scoring methods in IHC analysis is needed for further optimization of PD-L1 assays and adoption into clinical practice. The complexity of tumor-directed immune responses may likely preclude the use of a single biomarker to determine treatment responses; composite assessment of several biomarkers may ultimately be needed to inform clinical treatment decisions. In this context, there is accumulating evidence to indicate that data from other biomarkers such as tumor mutational burden or microsatellite instability status, combined with PD-L1 tumor expression, may be more informative in predicting response to immunotherapy.34,45 Prospective validation of these concepts in the context of therapeutic clinical trials is warranted. Alsaab HO, Sau S, Alzhrani R, et al. PD-1 and PD-L1 checkpoint signaling inhibition for cancer immunotherapy: mechanism, combinations, and clinical outcome. Front Pharmacol. 2017;8:561. Smart Patients. 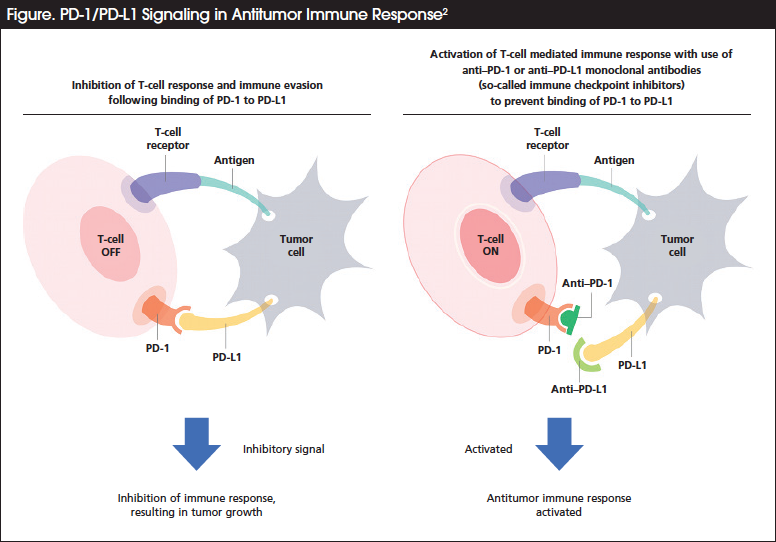 Cancer immunotherapy: PD-1 and beyond. www.smartpatients.com/targets/PD-1. Accessed May 26, 2018. Bellmunt J, Mullane SA, Werner L, et al. Association of PD-L1 expression on tumor-infiltrating mononuclear cells and overall survival in patients with urothelial carcinoma. Ann Oncol. 2015;26:812-817. Opdivo (nivolumab) [prescribing information]. Princeton, NJ: Bristol-Myers Squibb; 2018. Keytruda (pembrolizumab) [prescribing information]. Whitehouse Station, NJ: Merck & Co, Inc; 2017. Tecentriq (atezolizumab) [prescribing information]. South San Francisco, CA: Genentech; 2018. Imfinzi (durvalumab) [prescribing information]. Cambridge, England: AstraZeneca, Inc; 2018. Bavencio (avelumab) [prescribing information]. Rockland, MA: EMD Serono, Inc; 2017. Sunshine J, Taube JM. 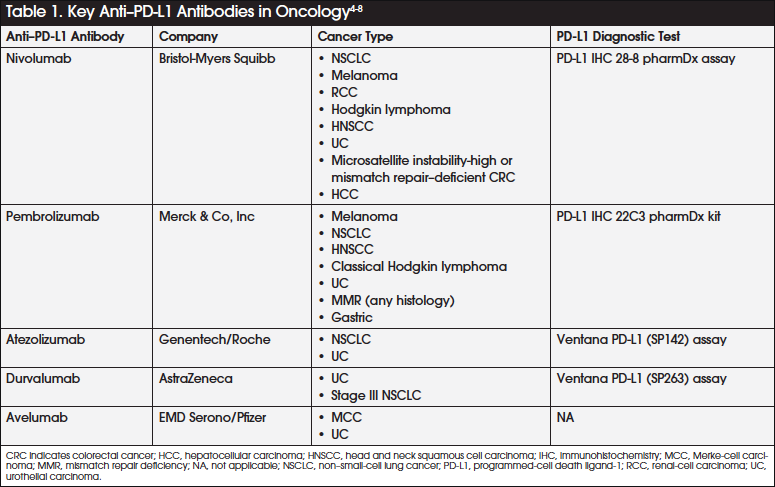 PD-1/PD-L1 inhibitors. Curr Opin Pharmacol. 2015; 23:32-38. Topalian SL, Hodi FS, Brahmer JR, et al. Safety, activity, and immune correlates of anti–PD-1 antibody in cancer. N Engl J Med. 2012;366:2443-2454. Garon EB, Rizvi NA, Hui R, et al. Pembrolizumab for the treatment of non–small-cell lung cancer. N Engl J Med. 2015;372:2018-2028. Herbst RS, Baas P, Kim DW, et al. Pembrolizumab versus docetaxel for previously treated, PD-L1-positive, advanced non-small-cell lung cancer (KEYNOTE-010): a randomised controlled trial. Lancet. 2016;387:1540-1550. FDA Approved Drugs. Pembrolizumab (KEYTRUDA) Checkpoint Inhibitor. www.fda.gov/drugs/informationondrugs/approveddrugs/ucm526430.htm. Accessed February 2, 2018. Lopes G, Wu Y-L, Kudaba I, et al. Pembrolizumab (pembro) versus platinum-based chemotherapy (chemo) as first-line therapy for advanced/metastatic NSCLC with a PD-L1 tumor proportion score (TPS) ≥ 1%: open-label, phase 3 KEYNOTE-042 study. Presented at: Annual Meeting of the American Society of Clinical Oncology; June 1-5, 2018; Chicago, IL. Abstract LBA4. Gettinger S, Rizvi NA, Chow LQ, et al. Nivolumab monotherapy for first-line treatment of advanced non–small-cell lung cancer. J Clin Oncol. 2016;34:2980-2987. Rizvi NA, Mazieres J, Planchard D, et al. Activity and safety of nivolumab, an anti-PD-1 immune checkpoint inhibitor, for patients with advanced, refractory squamous non-small-cell lung cancer (CheckMate 063): a phase 2, single-arm trial. Lancet Oncol. 2015;16:257-265. Brahmer J, Reckamp KL, Baas P, et al. Nivolumab versus docetaxel in advanced squamous-cell non-small-cell lung cancer. N Engl J Med. 2015;373:123-135. Borghaei H, Paz-Ares L, Horn L, et al. Nivolumab versus docetaxel in advanced non-squamous non–small-cell lung cancer. N Engl J Med. 2015;373:1627-1639. Reck M, Rodríguez-Abreu D, Robinson AG, et al. Pembrolizumab versus chemotherapy for PD-L1–positive non–small-cell lung cancer. N Engl J Med. 2016;375:1823-1833. Carbone DP, Reck M, Paz-Ares B, et al. First-line nivolumab in stage IV or recurrent non–small-cell lung cancer. N Engl J Med. 2017;376:2415-2426. Fehrenbacher L, Spira A, Ballinger M, et al. Atezolizumab versus docetaxel for patients with previously treated non-small-cell lung cancer (POPLAR): a multicentre, open-label, phase 2 randomised controlled trial. Lancet. 2016;387:1837-1846. Rittmeyer A, Barlesi F, Waterkamp D, et al. Atezolizumab versus docetaxel in patients with previously treated non-small-cell lung cancer (OAK): a phase 3, open-label, multicentre randomised controlled trial. Lancet. 2017;389:255-265. Antonia SJ, Villegas A, Daniel D, et al. Durvalumab after chemoradiotherapy in stage III non–small-cell lung cancer. N Engl J Med. 2017;377:1919-1929. Hellmann MD, Rizvi NA, Goldman JW, et al. Nivolumab plus ipilimumab as first-line treatment for advanced non-small-cell lung cancer (CheckMate 012): results of an open-label, phase 1, multicohort study. Lancet Oncol. 2017;18:31-41. Gandhi L, Rodríguez-Abreu D, Gadgeel S, et al; for the KEYNOTE-189 Investigators. Pembrolizumab plus chemotherapy in metastatic non-small-cell lung cancer. N Engl J Med. 2018;378:2078-2092. Paz-Ares LG, Luft A, Tafreshi A, et al. Phase 3 study of carboplatin-paclitaxel/nab-paclitaxel (Chemo) with or without pembrolizumab (Pembro) for patients (Pts) with metastatic squamous (Sq) non-small cell lung cancer (NSCLC). J Clin Oncol. 2018;36(15 suppl):105. Socinski MA, Jotte RM, Cappuzzo F, et al; for the IMpower150 Study Group. Atezolizumab for first-line treatment of metastatic nonsquamous NSCLC. N Engl J Med. 2018;378:2288-2301. Jotte RM, Cappuzzo F, Vynnychenko I, et al. IMpower131: primary PFS and safety analysis of a randomized phase III study of atezolizumab + carboplatin + paclitaxel or nab-paclitaxel vs carboplatin + nab-paclitaxel as 1L therapy in advanced squamous NSCLC. J Clin Oncol. 2018;36(18 suppl):LBA9000. Motzer RJ, Escudier B, McDermott DF, et al. Nivolumab versus everolimus in advanced renal-cell carcinoma. N Engl J Med. 2015;373:1803-1813. Atkins M, McDermott D, Powles T, et al. IMmotion150: a phase II trial in untreated metastatic renal cell carcinoma (mRCC) patients (pts) of atezolizumab (atezo) and bevacizumab (bev) vs and following atezo or sunitinib (sun). J Clin Oncol. 2017;35(15 suppl):4505. Wolchok JD, Chiarion-Sileni V, Gonzalez R, et al. Overall survival with combined nivolumab and ipilimumab in advanced melanoma. N Engl J Med. 2017;377:1345-1356. Robert C, Long GV, Brady B, et al. Nivolumab in previously untreated melanoma without BRAF mutation. N Engl J Med. 2015;372:320-330. Robert C, Schachter J, Long GV, et al. Pembrolizumab versus ipilimumab in advanced melanoma. N Engl J Med. 2015;372:2521-2532. Zhu J, Armstrong AJ, Friedlander TW, et al. Biomarkers of immunotherapy in urothelial and renal cell carcinoma: PD-L1, tumor mutational burden, and beyond. J Immunother Cancer. 2018;6:4. Rosenberg JE, Hoffman-Censits J, Powles T, et al. Atezolizumab in patients with locally advanced and metastatic urothelial carcinoma who have progressed following treatment with platinum-based chemotherapy: a single-arm, phase 2 trial. Lancet. 2016;387:1909-1920. Powles T, Duran I, van der Heijden MS, et al. Atezolizumab versus chemotherapy in patients with platinum-treated locally advanced or metastatic urothelial carcinoma (IMvigor211): a multicentre, open-label, phase 3 randomised controlled trial. Lancet. 2018;391:748-757. Bellmunt J, de Wit R, Vaughn DJ, et al. Pembrolizumab as second-line therapy for advanced urothelial carcinoma. N Engl J Med. 2017;376:1015-1026. Sharma P, Retz M, Siefker-Radtke A, et al. Nivolumab in metastatic urothelial carcinoma after platinum therapy (CheckMate 275): a multicentre, single-arm, phase 2 trial. Lancet Oncol. 2017;18:312-322. Powles T, O’Donnell PH, Massard C, et al. Efficacy and safety of durvalumab in locally advanced or metastatic urothelial carcinoma: updated results from a phase 1/2 open-label study. JAMA Oncol. 2017;3:e172411. Apolo AB, Infante JR, Balmanoukian A, et al. Avelumab, an anti–programmed death-ligand 1 antibody, in patients with refractory metastatic urothelial carcinoma: results from a multicenter, phase Ib study. J Clin Oncol. 2017;35: 2117-2124. Balar AV, Galsky MD, Rosenberg JE, et al. Atezolizumab as first-line treatment in cisplatin-ineligible patients with locally advanced and metastatic urothelial carcinoma: a single-arm, multicentre, phase 2 trial. Lancet. 2017;389:67-76. Balar AV, Castellano D, O’Donnell PH, et al. First-line pembrolizumab in cisplatin-ineligible patients with locally advanced and unresectable or metastatic urothelial cancer (KEYNOTE-052): a multicentre, single-arm, phase 2 study. Lancet Oncol. 2017;18:1483-1492. Ferris RL, Blumenschein G Jr, Fayette J, et al. Nivolumab for recurrent squamous-cell carcinoma of the head and neck. N Engl J Med. 2016;375:1856-1867. Chow LQM, Haddad R, Gupta S, et al. Antitumor activity of pembrolizumab in biomarker-unselected patients with recurrent and/or metastatic head and neck squamous cell carcinoma: results from the phase Ib KEYNOTE-012 Expansion Cohort. J Clin Oncol. 2016;34:3838-3845. Grigg C, Rizvi NA. PD-L1 biomarker testing for non-small cell lung cancer: truth or fiction? J Immunother Cancer. 2016;4:48. Colley EC, Stead RH. Optimized immunohistochemistry workflow facilitated by new Dako Autostainer Link 48 Software. www.agilent.com/cs/library/whitepaper/public/88005_holburn-white-paper.pdf. Accessed May 20, 2018. Ventana introduces the BenchMark Special Stains platform [press release]. Tucson, AZ: Ventana Medical Systems, Inc; March 19, 2012. www.prnewswire.com/news-releases/ventana-introduces-the-benchmark-special-stains-platform-143261766.html. Accessed May 20, 2018. Hirsch FR, McElhinny A, Stanforth D, et al. PD-L1 immunohistochemistry assays for lung cancer: results from phase 1 of the Blueprint PD-L1 IHC Assay Comparison Project. J Thorac Oncol. 2017;12:208-222. Rimm DL, Han G, Taube JM, et al. A prospective, multi-institutional pathologist-based assessment of four immunohistochemistry assays for PD-L1 expression in non-small cell lung cancer. JAMA Oncol. 2017;3:1051-1058. Ratcliffe MJ, Sharpe A, Midha A, et al. AACR 2016. Agreement between programmed cell death ligand-1 diagnostic assays across multiple protein expression cutoffs in non-small cell lung cancer. Clin Cancer Res. 2017;23:3585-3591. Brunnström H, Johansson A, Westbom-Fremer S, et al. PD-L1 immunohistochemistry in clinical diagnostics of lung cancer: inter-pathologist variability is higher than assay variability. Mod Pathol. 2017;30:1411-1421. Shin SJ, Jeon YK, Cho YM, et al. The association between PD-L1 expression and the clinical outcomes to vascular endothelial growth factor-targeted therapy in patients with metastatic clear cell renal cell carcinoma. Oncologist. 2015;20:1253-1260.